I understand if you're using Linux (which I always do) because this uses /dev/urandom — which is changed according all the many things that go on in the operating system —it makes it nigh impossible to predict. Is it the unpredictability that makes it secure? I can't help thinking it's less secure because the output is hexadecimal and therefore is less hard to guess or brute-force than a string with the same number of chars that contains the rest of the alphabet, uppercase letters, other symbols, etc. Is this why when people refer to tokens they refer to the bit length as opposed to char length? In all instances I would use randomString() over token() so I guess I'm asking if and why I'm wrong in any of the above. The primary concern with random number generators is generally not the output created, but the predictability in which this data is generated. Your basic question is why not use array_rand (which internally uses php_rand) over openssl_random_pseudo_bytes for cryptographic purposes. The answer has to do with the technique each function takes, with array_rand being a much more predictable (and reproduce-able) approach. See Pádraic Brady's article "Predicting Random Numbers In PHP – It’s Easier Than You Think!" for more detail: http://blog.astrumfutura.com/2013/03/predicting-random-numbers-in-php-its-easier-than-you-think/. Concerning the output of random number generators, password/key strength in relation to brute force attacks is often measured in entropy. This is usually listed in bits with the more bits the better. The Wikipedia page on password strength (http://en.wikipedia.org/wiki/Password_strength) has some great reference tables for determining the entropy level of passwords at different lengths and using various combinations of character types. The openssl_random_pseudo_bytes() function utilizes all binary/hex values resulting in a full 8 bits of entropy per symbol. 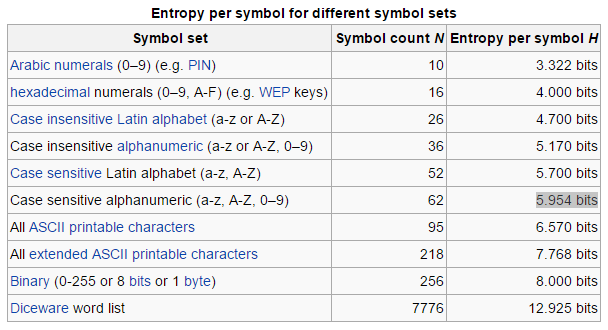 At best your randomString() function would result in 5.954 bits of entropy per symbol. Not the answer you're looking for? Browse other questions tagged php security token or ask your own question. Why should a salt have the same length as the hashed value? Is Blowfish necessary for security token in PHP remember me system?